To lit the light in the lives of the of the visually impaired students, A massive reading fest is being organized by the NGO, Lit the Light. Started few years back, NGO Lit the light has organized cricket tournament for Visually challenged people and has sent various visually challenged citizens to the world tournaments like Commonwealth Judo Championship and Cricket world cup for Blind people. NGO have recognized the singing talent in Jothi who has now sung a song under the music direction of GV Prakash Kumar. 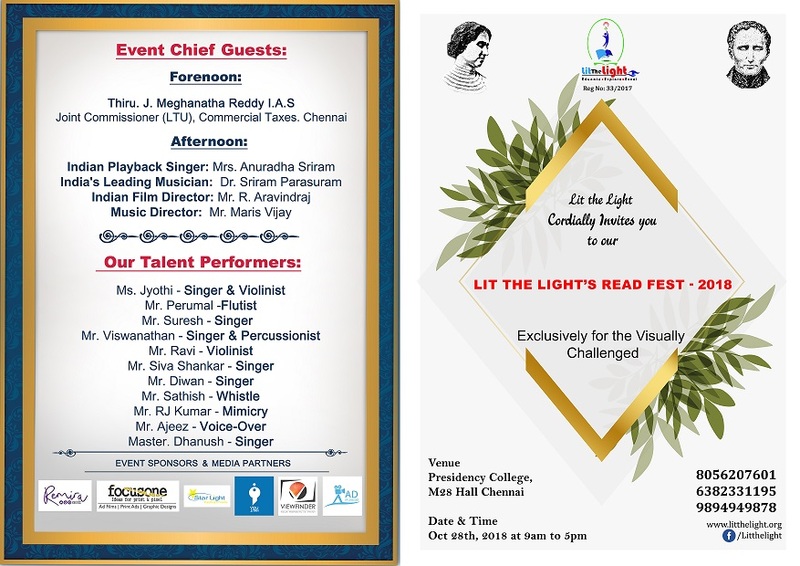 Lit the Light reading fest – 2018 will happen in Madras presidency college on 28 October 2018 at 10.00 AM. 200+ visually impaired students and 200+ first time volunteers will participate in the reading program which will be followed by Talent recognition shows. The event will be inaugurated by Meghanatha Reddy, IAS. Singers Sriram Parasuram & Anuradha Sriram, Music director Maris Vijay and Film director Aravind raj will also participate in the event to encourage and motivate the Visually impaired students. Every year 20000+ Visually impaired students are not able to graduate as they don’t have sufficient number of scribes for writing the examination. It takes 5-6 years to complete a 3year degree course for a visually impaired students due to the unavailability of scribes. To reduce the inordinate delay and challenges faced by Visually impaired people, this massive event is being organized by Lit the Light.